From this beginning the City of Atlanta (which was incorporated the following year) has grown in its own distinct way. 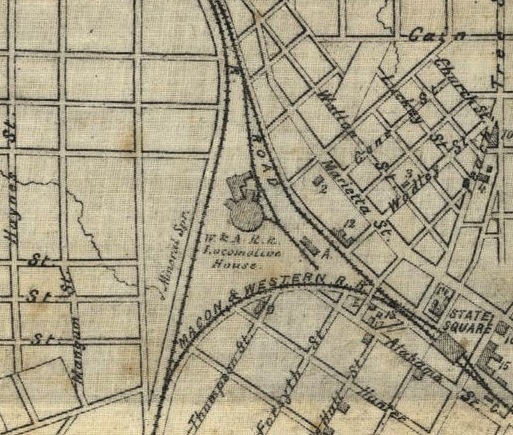 The Circle Wye railroad junction has literally shaped the City that we live in and its form and effect on our City are still present today after more than 165 years. The junction is contained in what is locally referred to as “the Gulch.” With the loss of Atlanta’s Terminal Station and plans for a multi-modal station to be located on or near this site, the Atlanta Preservation Center is advocating for the unique shape and history formed by these railroad lines to be kept intact and honored with future designs of the site. A study done by the Georgia Department of Transportation in the spring of 2012 for the Georgia Multi-Modal Passenger Terminal project was used in this description and is accessible by clicking here. Please note that Circle Wye information is on document pages 165-179.